Being a pastry chef I try a lot of desserts and although I love trying new things, there are a few favorites that I always go back to. I find when a classic dessert is done really well it speaks for itself, and this cheesecake does exactly that. I cannot even begin to tell you how many times I have made this. It’s always a hit at parties, and it has also been one of my biggest sellers every time I put it on one of my menus. This cheesecake has a very elegant look and the hot pink color of the raspberry swirl going through it just makes the whole thing pop. Aside from adding a beautiful color to the cheesecake, the raspberry swirl also adds a vibrant flavor. The slight tartness cuts the sweet, creamy texture of the cheesecake perfectly. Mix melted butter and graham cracker crumbs until combined. Press mixture into a 9″ springform pan. Whisk together puree and cornstarch till there are no lumps. Set aside to thicken while you make the cheesecake batter. Wrap the springform pan in plastic wrap and aluminum foil. Pour half the cheesecake batter into the cooled crust. Spoon in half the raspberry puree and swirl with a toothpick. Pour in the remaining cheesecake batter. Spoon in the remaining raspberry puree and swirl with a toothpick. Place the pan in a roasting pan and fill half way with hot water. Bake for 1-11/4 hours until it sets and starts to get a slight golden color. When the cheesecake is done remove from water bath and set on a cooling rack. >Cheesecake is a favorite of mine and this looks awesome. I especially like the first pic sitting in that raspberry world, very clever! >I think I might try this in reviewing the recipe I have 2 questions (I'm sure they are, "this lad is an idiot" questions, but…oh well, I want to succeed in my efforts. 1)-for raspberry puree did you just blend raspberries or did you add something else to it? 2)-step 7…how long to I cook it for? 1 11/4 hour? Is that right or is that a typo? >This cheesecakes looks so delicious. My husband loves raspberries so he will be excited! I will give your recipe a try soon. >Wow this cheesecake looks beautiful! I don't care for plain cheesecake so this is perfect for me. Def need to try! >It must be cheesecake week! I've been absolutely blown away by some of the nummy cheesecakes in the blogosphere today. If Mother's Day = cheesecake, here's me hoping for some itty bitties soon 🙂 Thanks so much for sharing, smashing recipe! >Stunning cheesecake. I think raspberry is the best sort of swirl there is! And the best sort of cheesecake is one made for mom! >I can see why it is one of your best sellers! Looks super delish! >i just watched the video…i love videos… all my questions were answered! >It looks so well done! Now I have a hankering for cheesecake. >This is a gorgeous cheesecake and I utterly adore the top picture, with all the berries! >This looks soo good. Great for serving, its so pretty! >That swirl is so beautiful. I adore cheesecake and the raspberry is so yummy. 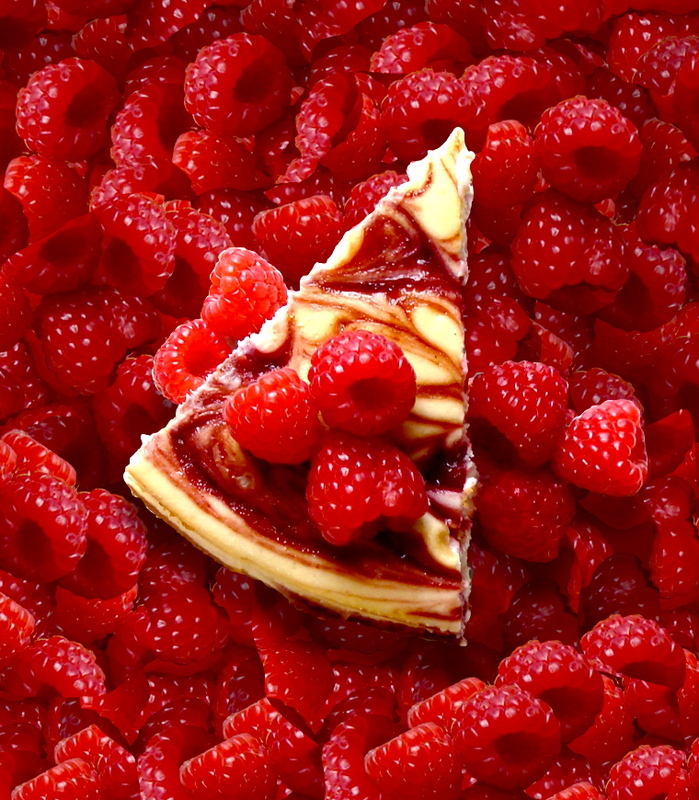 >This is so pretty and I am a raspberry cheesecake fan. I can imagine that your mom will be tickled "pink" with whatever you make for her. >I am such a cheesecake fan! So far, I have managed to make sweet potato cheesecake, and pumpkin cheesecake. I am definitely going to try this one now! Thanks! >I am not even that big of a fan of cheesecake, but this looks like it could make me a convert! >Just beautiful! I love all the raspberries in your first picture! >Just went in the oven. When do you pop it out of the spring form? Gwen I'm glad the video helped! Refrigerate it overnight in the springform pan and it will pop off easily tomorrow. So happy you made it. Enjoy! >Yes, please!! I would like to have the entire thing!! It's beautiful! >Wow! Just a stunning photo…and I know it tastes fabulous, too! Love this one…mmmmm. 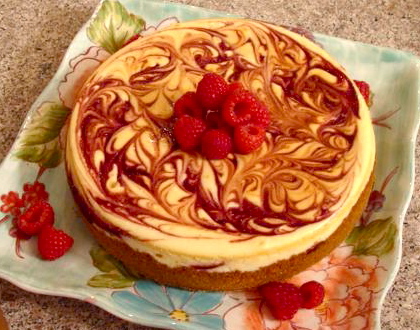 >Beautiful cheese cake, especially the luscious swirls of Raspberries. Exquisite! >Wow, what a beautiful cheesecake!! >his cheesecake is so very beautiful – almost too pretty to eat! >I definitely love the color of this cheesecake. Yummy! >I agree with you, I'm always trying new recipes, but yet my family will request old favorites. Cheesecake happens to be a personal favorite of mine. Love all the raspberries in the photo. >Beautiful, and elegant cheesecake…love the first photo with all the berries around it. >Wowwww!! !…It' a sin…(smiles). Very nice, sweet! I liked yours recipes. So, I'm a new follower of your blog. Please, I invite you to know my blog and to know a little the brazilian food. >This cheesecake just made my day. I have to make it! Totally am looking for a new cheesecake to try…This looks really good. I saw you use goat cheese in some cheesecake recipes…sounds really interesting! I know people who use ricotta, marscapone and farm cheese (I think thats one its called :O ) I will definitely have to try this. Thanks!